NOTE BY NORSE: City politicians in Vancouver, WA has taken a dramatic step in decriminalizing not just sleeping, but camping itself at night, anticipating that they will lose a court fight. The DOJ recently filed a “statement of interest” holding that camping bans in cities with no adequate shelter (i.e. everywhere, and particularly in Santa Cruz) violate the U.S. Constitution’s ban on cruel and unusual punishment. 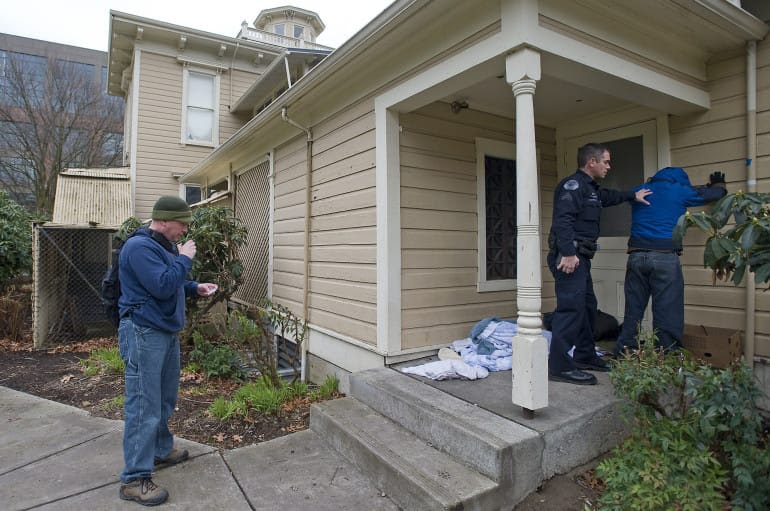 This is not a court precedent, but could lead to one, and Vancouver politicos–who likely have no more compassion for homeless folks than the chairwarmers in Santa Cruz–are nervous. I regard this as a major breakthrough and a good issue for the unhoused and housed supporters to bring to the 9-22 Santa Cruz City Council and community. The public education campaign at City Council can be sandwiched nicely in-between a scheduled 3 PM press conference denouncing violence against homeless advocates and individuals and the 11th SleepOut slated for later that night. Last night, police falsely arrested Abbi Samuels for “insufficient ID” (the charge was “obstructing an officer’) when they knew perfectly well who she was. First Alarm security guards, concealing their name tags and badge numbers brutalized Christina Barnes for battery after stalking her throughout the early evening. Some have suggested taking sleeping bags into City Council chambers during the evening and simply rolling them out to sleep there, given the city refusal to fund emergency shelter or lift the sleeping ban, as Vancouver is now doing. Folks are invited to come on down to witness or participate in the day (and night)’s events. VANCOUVER, Wash. – The Vancouver City Council is considering allowing homeless people to sleep outside overnight legally. The city has banned people from camping outside in public places since the late 1990s. Police stopped enforcing the ban entirely about two weeks ago after the U.S. Justice Department put out a statement of interest on Aug. 6 saying the government can’t ban people from sleeping outside. The document says banning people from doing so is like saying being homeless is illegal, which the Justice Department says is unconstitutional. Tents and tarps line the streets around the Share House homeless shelter on West 13th Street in Vancouver. Katherine Garrett, the shelter’s program director, said the problem is worse than ever. “I’ve never seen this much open camping before,” said Garrett, who’s been working with the homeless in Vancouver since 2001. She said the Share House is now serving a record 9,000 meals per month. Technically, the people camping out in the area are now breaking the law. Since 1997, the city has made camping in public places a misdemeanor. Police Chief James McElvain told KATU officers hadn’t been cracking down on illegal camping all that much. “On average, we were finding our officers citing about nine people in a month,” said McElvain. A proposed ordinance going before the city Monday night would allow people to camp out legally from 9:30 p.m. to 6:30 a.m.
McElvain said the ordinance would still allow police to crack down on other behaviors. Kevin Lisman, who just became homeless in March, said he wishes people would have more sympathy. We are pleased that cities are paying attention to what the Justice Department has said, and that they are revising their criminalization policies. We are concerned, however, when cities attempt to do the bare minimum. Vancouver’s law does not go far enough to address the constitutional problems identified by the federal government. Moreover, it is not the kind of constructive policy that the federal government is actively promoting, and that other cities are successful implementing. The much more cost-effective, constitutional, and humane approach is to provide permanent housing to homeless people. Amending a Vancouver city ordinance to allow overnight camping in public places is just a “baby step” toward solving the city’s homeless troubles and lack of shelter space, citizens told the city council Monday. “I don’t want to see the council put a bow on our problem and make it look all pretty by providing (camping) hours when we’re not addressing the real issues,” Hough neighborhood resident Heidi Owens said. The council unanimously voted Monday to change Vancouver’s unlawful camping ordinance to allow camping in public places from 9:30 p.m. to 6:30 a.m. Such overnight camping previously had been a misdemeanor. The change wouldn’t affect park hours (parks close from 10 p.m. to 5 a.m.) or laws prohibiting disorderly conduct, drinking in public, urinating in public and other health and safety issues. The city’s legal staff recommended the change in response to a federal Department of Justice opinion, issued Aug. 8, on a case pending in federal court in Boise, Idaho. The opinion states that outlawing camping in all places and all times, including when shelter space is unavailable, is cruel and unusual punishment and therefore unconstitutional. Basically, the opinion says, all people have a right to sleep. Mayor Tim Leavitt said he realizes some residents aren’t happy about the change to the camping ordinance. “We have to do this because we’re not going to win taking on the Supreme Court,” he said. City Manager Eric Holmes emphasized that the ordinance revision is an interim measure while the city continues to look for solutions. Vancouver has a lack of toilets, showers and trash cans for the homeless — and an overwhelming need for beds. Andy Silver, executive director of the Council for the Homeless, told the city council that 823 different people called the housing hotline this summer asking for emergency shelter. The agency was forced to say no to 722 of them — 88 percent — due to lack of shelter space, he said. Katherine Garrett, director of Share House, said that in the eyes of landlords, people who have three camping violations on their record might as well have a felony. Continuing to cite homeless people, fine them and jail them hinders their movement forward and keeps the cycle of homelessness going, she said. “They don’t have a chance,” she said. Police would not be doing “sweeps” of homeless camps, but they would respond to complaints from neighborhood residents and business people about problems such as fighting and drinking in public, Vancouver Police Chief James McElvain said. Even then, officers have discretion about handling situations. Protests Demanding End to Backpack Bigotry Resume 1 PM March 5th Wednesday at S.C. Coffee Roasting Co.
Pensacola may repeal its blanket ban; Santa Cruz has no such plans.